Sous vide cookers are huge right now, and we couldn’t be more happy about this trend. For those unaware, sous vide precision cookers involve sealing food in an airtight bag and submerging it in water, then slow-cooking it at the target temperature. You end up with perfectly cooked food every single time, without fail, and all the delicious flavor is locked in since it has nowhere to go. We defy you to sous vide a steak one time, finish it in a pan with some butter, and see if it’s not the best steak you’ve ever cooked. 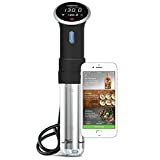 Amazon was running a killer deal for Black Friday on the best-selling sous vide out there, the Anova Culinary Sous Vide Precision Cooker with WI-FI + Bluetooth. This awesome model cooks with perfect accuracy, and it also connects to you iPhone or Android so you can control and monitor your cook from anywhere. It was available last week at a huge $100 discount, and now Amazon has turned up the heat again for Cyber Monday 2018 — it’s back down to $99! This is the perfect gift for yourself or anyone on your list for the holidays, and there’s a good chance it’ll sell out.